When you are planning your dream home, the interior decoration is not the only thing which you should focus on. There are many other aspects in which you should also figure out, and this includes the placement of various power outlets. If you have a house that you would like to do up, then do ensure that the exterior has its fair share of power outlets. Otherwise, you might end up with your fair share of unsightly extension cords around the home. The $229.95 Light Socket Powered WiFi Security Camera is certainly a device that kills two proverbial birds with a single stone. 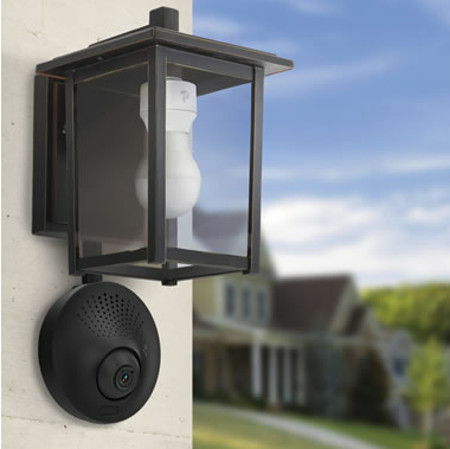 The name of the device gives itself away — it is an easy-to-install home security system which can be retrofitted as a motion-sensing WiFi camera to an outdoor porch or garage light. Installation can be done in double quick time since there is no need for any kind of wiring. Each purchase comes with a smart light bulb adapter that can be screwed into the current light socket so that power is available to the wall-mounted wireless HD video camera through a short cord. The camera’s infrared sensor will be able to detect whenever someone approaches and automatically sends a notification to your paired WiFi device thanks to a free app. The camera will record and stream video, allowing you to know what’s going on at home as long as there is a decent Internet connection.